Destructive Category 4 Hurricane Harvey Makes Landfall. Where is it going next? Hurricane Harvey has made landfall near Rockport, Texas as a Category 4 Hurricane with maximum sustained winds of 130mph and gusts of 160mph. Harvey joins a notorious list of hurricanes this evening as one of the strongest hurricanes to ever strike the continental United States. Harvey is now the strongest hurricane(based on wind speeds) to make landfall in the US since Hurricane Charley in 2004. Life-threatening devastation likely in Texas from flash flooding, storm surge, and wind damage. 6-15 feet of storm surge possible in Texas north of Corpus Christi. The system was only a tropical depression 48 hours ago. Hopefully everyone headed evacuation orders. The pivotal question? Where will Harvey trek after it makes landfall in Texas. Reliable forecast models suggest Harvey will likely stall over Texas for 24-48 hours, potentially 48+ hours! That will lead to catastrophic flooding & significant potential for property damage wherever the heaviest rain sets up. 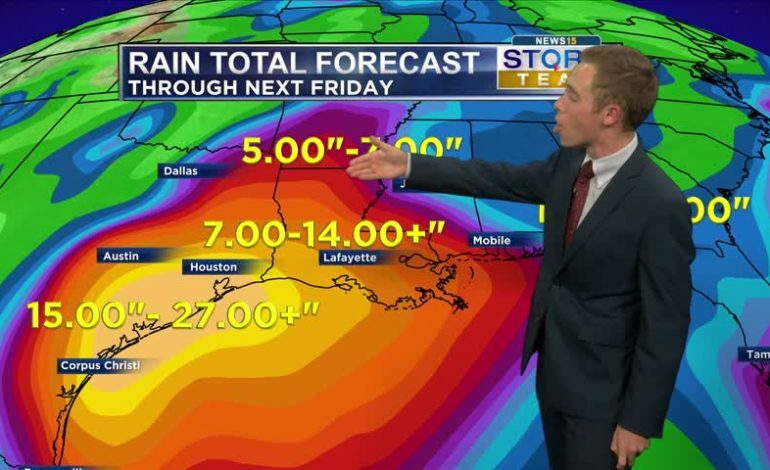 Up to TWO-THREE FEET of rain is forecast for Texas. After that time, there is concern per the latest forecast models for potentially significant impacts from Harvey across Acadiana & Southwest Louisiana Saturday-Thursday in the form of significant rainfall. If you haven’t already, make sure you’re making preparations tomorrow. At this point, we are worried about rain and not wind. But that could change depending on Harvey’s exact forecast path. The National Hurricane Center’s latest track brings Harvey towards the east over southeastern Texas by Sunday-Tuesday. This forecast track would put Acadiana & southwest Louisiana would be on the eastern side(wet & nasty side) of the system. 7-14+ inches of rain possible with localized 16+ inches. In addition, if the system remains gets back over water, the system could regain tropical storm strength. So, we would have the potential for tropical storm force wind gusts in feeder bands, 2-5 feet of coastal flooding, and isolated tornadoes. IF the forecast track verifies. There is a LOT of uncertainty in the exact strength & path that Harvey could be by then. The latest GFS models dumps 10-16 inches of rain on Acadiana, but it never sends any wind impacts our way. The Euro & the CMC models showcase a different scenario with the potential for tropical storm type conditions Tuesday-Thursday. Endless scenarios are still on the table for our exact impacts, but the bottom line is we need to be prepared for a potentially significant rainfall event. The exact magnitude of potential impacts will evolve as we move forward in time and and learn more on Hurricane Harvey’s future path after landfall in Texas. We need to be prepared now for the potential for a long-duration heavy rain & potential flood event through Thursday. Clear out storm drains, secure loose objects that could potentially clog storm drains, & prepare to fill-up sand bags if you live in a flood prone location. Also, go to the store and stock up on essentials. Batteries, flashlights, water, and non-perishable food is also a good move to make. Stay tuned for more further updates.